The best thing about running long distance: getting to eat carbs the night before! This is my go-to pasta dish. 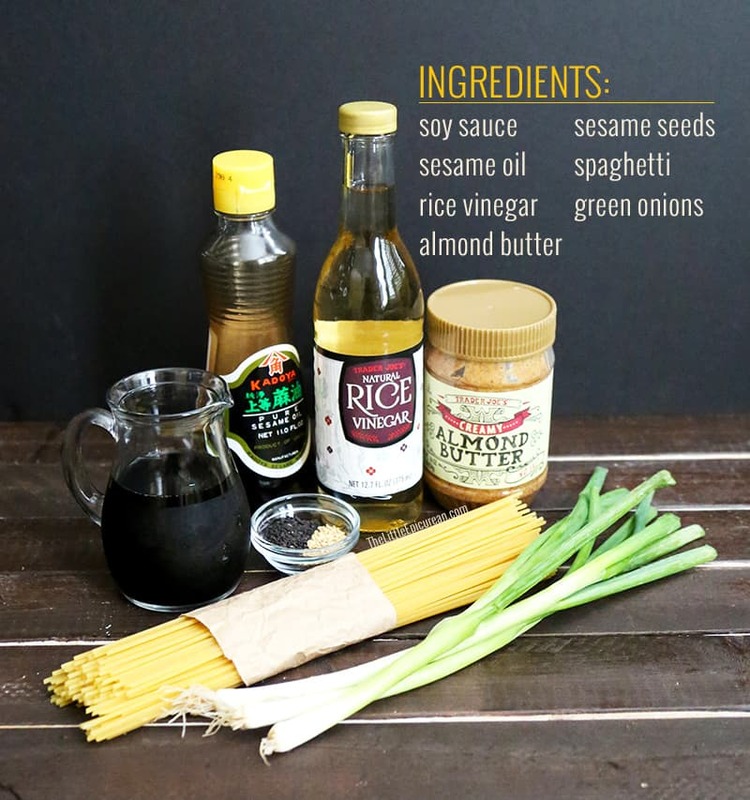 It’s super simple to make and I always have these 5 main ingredients on hand (spaghetti, soy sauce, sesame oil, rice vinegar, and no-salt, creamy almond butter). The night before the marathon, I can’t wait to eat a giant bowl of pasta. 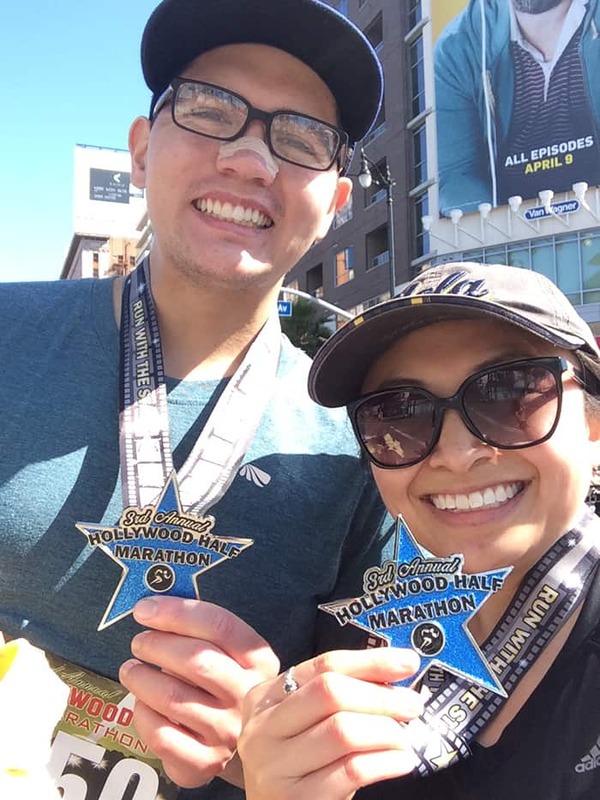 This past Saturday, Alex and I partook in the 3rd annual Hollywood Half Marathon. The marathon started at 6am. We left our place at 4:45 am, giving ourselves ample time to park and get settled in. While it only took 25 minutes to get to Hollywood, it took much longer than expected to find parking. I was aware of the street closures, but the traffic surrounding the marathon route was horrendous! We couldn’t find any open parking structures and street parking was hopeless. Eventually, we ended up parking across the street from the Hollywood Bowl, a little over half a mile from the starting line. By this time, it was already 6:20am. We ran the to the starting line, hoping and praying we could get in with the last wave of runners. There was no time to stretch, no time to calm our nerves. One we made it to the starting line, it was time to book it and run! I’m happy to say 13.1 miles later, we survived, and we finished! I’m so proud of Alex for completing his first half marathon. (When I first met him, he could hardly run a mile with me!) This was my fourth half marathon, and it does get a lot easier over time. Although, I’m still gathering the courage to sign up for a full 26.2 mile marathon. 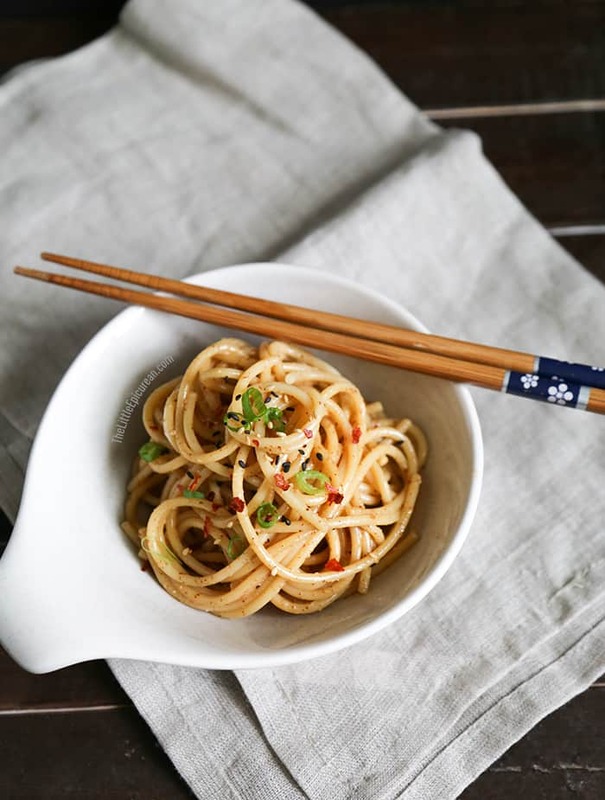 So back to the dish- this sesame almond noodle is super easy to make. Eat it hot or cold, it is delicious either way. Plus, it is vegetarian! It can be made vegan using pasta made without eggs. AND you can even make it gluten-free by substituting tamari gluten-free soy sauce and an alternative pasta like corn pasta or quinoa pasta. I prefer to use spaghetti pasta instead of Japanese buckwheat or udon. Spaghetti is a stronger noodle and it is less likely to break when you toss the sauce in. Spaghetti is also readily available, making this recipe very easy to replicate. Udon and soba noodles can get pretty sticky once cooked, especially if you are trying to coat them in a creamy sauce. Of course, this noodle dish isn’t just for pre-marathon carb-loading. If you don’t want to eat too much carbs, you can toss the noodles in a salad of shredded carrots, cucumbers and bean sprouts for a healthier and lighter option. During the summer months of grilling season, I like to add grilled tofu or chicken alongside these noodles. Cook spaghetti to al dente in a pot of salted water according to package directions. Drain and rinse with cold water to stop cooking. Drain and set aside. In a large liquid measuring cup, combine almond butter, rice vinegar, soy sauce and sesame oil. Stir to combine. Let sit for a couple minutes to allow almond butter to dissolve. **If sauce is too thick, add 1 Tbsp water to thin out slightly. 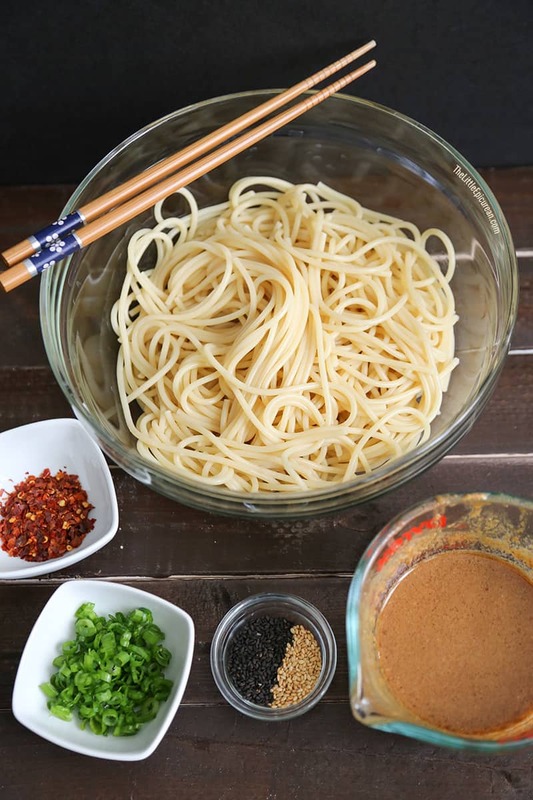 Once sauce is smooth, pour over cooked spaghetti noodles. Toss to combine. 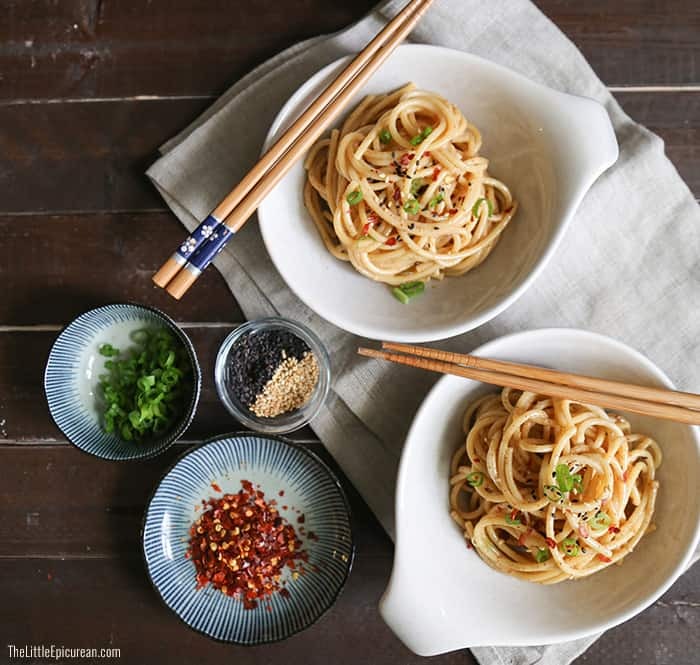 Serve with chopped green onions, toasted sesame seeds, and crushed red pepper flakes. Enjoy warm or chilled. That sounds so stressful! That’s always one of my biggest fears when we do races. Glad to hear everything worked out ok. This pasta is gorgeous and sesame pasta is one of my faves. Pinned!